The US Army Corps of Engineers Engineering Research and Development Center (ERDC) funded a study to evaluate the capabilities of GSSHA to simulate flooding caused by a hurricane storm surge. The objective of the case study was to assess model performance and provide a template for future studies using similar model capabilities. 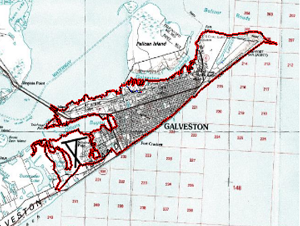 The site chosen for this case study was Galveston Island, Texas, where Hurricane Ike made landfall in September 2008 causing massive flooding on the island. Aquaveo was contracted by ERDC to perform the research study in which GSSHA model results were compared against actual inundation depths reported by the National Oceanic and Atmospheric Administration (NOAA) for the event. The storm surge data was obtained from NOAA Tides and Currents website for two of the tide gages (Galveston Pier and Pleasure Pier). A 60m resolution GSSHA grid was created to sub divide the model domain. Results from the model showed good agreement with flood depths reported by NOAA. 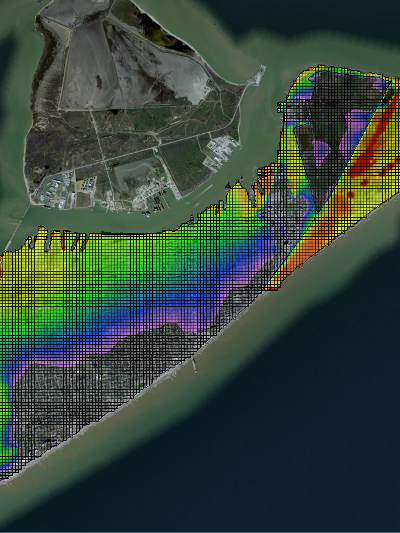 The model successfully demonstrated the capabilities of GSSHA for storm surge applications and resulted in a step-by-step tutorial showing how similar models can be developed in the future.